For over a quarter of the variants tested, Google Scholar was missing true positive articles from its search results. Additionally, for over half of the variants tested, Google Scholar had a significant number of false positive articles in its results which needed to be read by variant scientists to exclude. Using Mastermind as a primary source for variant search, supplemented by Google Scholar, can ensure the most comprehensive and accurate results. Moreover, once a relevant reference has been identified in GS search results, the searcher must leave the page and go out to the publication source to find, download, and sift through the entire article to confirm that the identification of the variant is accurate and not a false positive. I encountered these challenges in my clinical and research practice when using Google Scholar, and I thought, “Why can’t this data come to me?” instead of needing to go out to the data each time I searched for a variant. Mastermind is a tool designed to do just that. The Mastermind Genomic Search Engine uses automated techniques to index the full text of millions of highly prioritized articles and provides search results that eliminate the need to scour the references manually. All of this information is organized by disease-gene-variant relationships in the Mastermind database, and can be queried using the web-based user interface. 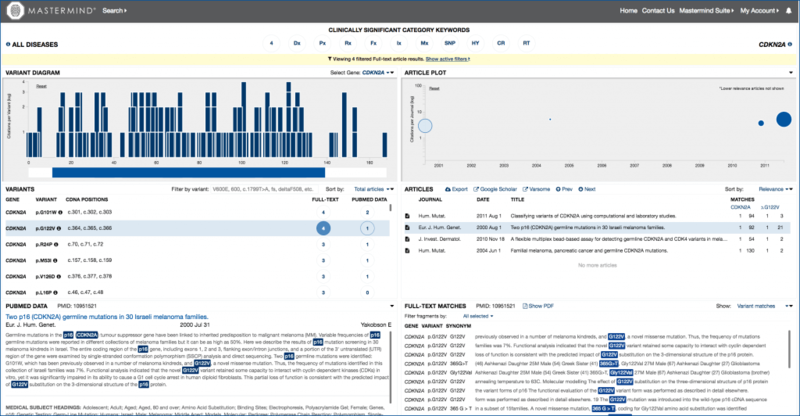 Mastermind prioritizes and displays results that cut the time it takes to perform the literature curation required for variant interpretation. A common question we are asked is how the accuracy of Mastermind search results compares with GS. Namely, does Mastermind find the same articles as GS, and is it able to reduce the number of off-target results that can sometimes be seen when performing GS searches? This gets at the sensitivity and specificity of Mastermind search results as compared with a commonly used tool such as GS. Read on for the results of our test. To understand how Mastermind results compare with those of Google Scholar, we asked several of our users for a random selection of variants encountered in their clinical workflow that they had previously assessed using GS to identify articles. The same users then manually reviewed those articles to determine whether they in fact contained the variant or were false positive results. We then asked them to determine whether the same articles were found using a Mastermind search. The results were analyzed to determine Mastermind sensitivity and specificity, and to further determine whether GS missed any articles that were likely to contribute to a more accurate interpretation of the clinical significance of the variant. In total, we received 192 variant search examples from users. Each variant was searched in GS using a multi-parameter search to ensure that both cDNA and protein level descriptions of the variant would be found (as typifies most GS search practices). An example search is presented below, given as the GS search criteria with the equivalent Mastermind search criteria. The articles as identified by PMID resulting from both the Mastermind and GS searches were enumerated and then manually reviewed and scored as being true positive (TP, article containing the variant) or false positive (FP, article containing something other than the variant or otherwise matching the variant but belonging to a different gene). Overall for the 192 variants tested, Mastermind performed very favorably compared to GS for the True Positive rate, and especially for the False Positive Rate. Fig. 5 A table of the True Positive findings based on manual review. Mastermind found more PMIDs than GS in 25.5% of these cases, compared with only 9.4% of cases where GS found more PMIDs than Mastermind. Fig. 6 A table of the False Positive findings based on manual review. Google Scholar returned false positive PMIDs in 67.7% of cases (52.1% + 15.6%). Mastermind returned far fewer False Positive PMIDs, and on a per case basis returned False Positives in only 16.6% of cases (1.0% + 15.6%). The ability of Mastermind to be automated using custom-designed APIs to further augment workflow efficiency. In summary, using Mastermind as a primary source for variant search, supplemented by Google Scholar, can ensure the most comprehensive and accurate results.